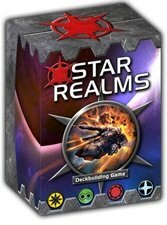 Star Realms is a deck-building card game for any number of players (each copy of the game lets you add up to 2 more players) by designers Robert Doughtery (co-designer of Ascension and it’s expansions) and Darwin Kastle (co-designer with Doughtery on Battleground: Fantasy Warfare). The designers and several of his playtesters are Magic: the Gathering pro tournament players. The result is a game which has a large variety of cards and a fantasy theme like Magic. Being a deck-building card game, it is only natural for gamers to wonder how Star Realms compares to other deck-building card games, especially Ascension since it was also designed by Doughtery. This review will draw such comparisons for those that are familiar with other deck building games. Like many other deck building games, in Star Realms, players start with their own deck of 10 cards, from which they shuffle and deal themselves a hand of five cards. 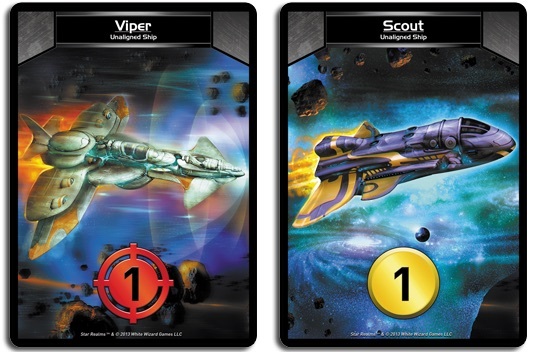 The starting cards in each player’s deck consists of 8 scout cards that provide 1 money unit for purchasing new cards and 2 viper cards that are worth 1 attack each, for attacking your opponent(s). By comparison, the Ascension starting decks have 8 money cards and 2 power cards (for attacking monsters). Unlike other deck-building games, players also start with 50 authority in normal games. Think of authority as hit points in an RPG game. When a player is out of authority, they are out of the game. Cards played from a player’s hand, granting an effect, are either ships (like heroes in Ascension), which are discarded to the player’s discard pile at the end of their turn, or bases (like constructs in Ascension), which stay out in front of the player (until and unless another player destroys the base, which forces the card to be moved to their discard pile). Unlike Ascension, there are two types of bases: outposts and normal bases. Outposts must be attacked and “destroyed” before attacking other bases or an opponent directly. Unlike Ascension, Dominion and most deck-building games, there are no victory points and cards purchased during the game are worth nothing at the end of the game. The game is played until all but one player has no authority left. Also, unlike most other deck building games, you can scrap some cards without playing a card that lets you scrap other cards. Scrapping a card (out of the game) using the card’s scrap ability usually gives you a benefit like money to spend that turn (essentially letting you upgrade a 4 card cost into an 8 cost card using other money in your hand) or an extra attack that might be enough to finish off an opponent and win you the game. Cards can also be scrapped using a scrap action thus “thinning your deck”. Players choose from a trade row of 5 cards (ships and bases) which can be bought that are drawn from a single deck of cards. While this sounds like Ascension (which has a center row of 6 cards), Ascension’s common deck for the center row also features monsters. The difference is that you would be more “subject to the luck of the draw”. Sometimes there would be no cards you could buy because there were a lot of monsters or vice-versa. If you had an attack of 1, it is useless in Ascension. In Star Realms, you can attack your opponent for 1 (unless they have an outpost base in play). In addition to the trade row of 5 cards, there is a pile of explorers, which are worth 2 trade when played, like the Mystic in Ascension. However, there are no other common piles, unlike Ascension. 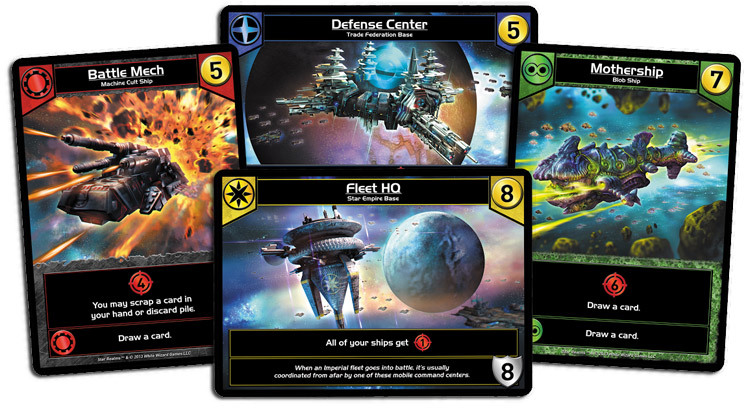 Star Realms, like Ascension, features 4 factions. Many cards feature an “ally ability”. If you have another card in play from the same faction (ship or base), you get an extra ability (more money, more attack, draw a card, etc. )Ascension had something like this, but much fewer cards had such an effect, so you wouldn’t see it as often as you see it in Star Realms. Star Realms is purely a card game, it comes in a card box and is close to the size of a standard deck of cards. It sets up and cleans up very quickly, as a result. It comes with 80 Trade Deck cards, 8 scouts and 2 vipers for each player, 10 explorers and two-side authority cards for keeping track of authority. Promo cards are already available (and came included to Kickstarter backers). Included are scenarios for playing 1 player, gambits which are cards which have only a scrap ability (a powerful ability which you can use one time and then scrap the card), merc cruisers (which shuffle into the trade deck) which match every faction (choose one faction when playing it) for ally abilities as well as extra cards to just shuffle in the trade deck. It seems that some of the main difficulty in teaching deck building games such as Dominion and Thunderstone to new players is explaining the restrictions of “one action” and “one buy”. Without these restrictions, Star Realms, like Ascension, is an easier game to teach to new players. Those who have played Dominion and/or Thunderstone before do not seem to have much trouble since they have a frame of reference, with many common terms (scrapping instead of trashing) and are used to having their own separate deck of cards to play with. With only 1 set pile for purchase and a random selection of trade cards to buy, it is a much more tactical game than Dominion or Thunderstone, more like Ascension. You can build a trade heavy or a combat heavy deck, go ship heavy or base heavy. You cannot be sure of what types of cards, i.e. factions and cost, will be available on your turns. In Dominion, it is easier to develop a strategy of which cards you will purchase and use since the set piles will be available for many turns. Gamers should take these factors into account when deciding whether they think they will like Star Realms. I think gamers who like Ascension will also like Star Realms. However, it may appeal to more gamers since I have seen frustration develop over what monsters are available to attack in Ascension. I have seen players with 5 attack but no monsters in the center row. In Star Realms, you would almost certainly be able to attack an opponent for 5 damage (only an outpost with more than 5 hit points would stop you from doing some damage). While I myself do tend to like games that are more strategic than tactical, I do like Star Realms more than Ascension. Overall, Star Realms is a fun game and I like the theme, which helps.